The Long Way Home is the first instalment of Kate's life story. 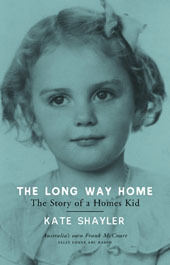 Kate grew up a "homes kid" in the 1950s and 60s, institutionalised into the Burnside Children's Home as a young child after the death of her mother. Kate and her two siblings were placed by their father into the Pennant Hills Burnside. Kate quickly learns to live by the rules of the home and endure the loneliness, cruelty, loss of self and sense of betrayal that came from her life in the homes and her monthly visits to her abusive father. Despite the subject matter, Kate's writing style is anything but self-pitying. Within the story is an uplifting sense of community, camraderie, and the humour that life through the eyes of a child can bring. Kate created her own sense of family and her own self-worth and her strength and resilience shine through in her writing. Despite a childhood darkened with death, sexual abuse and the pain of separation, Kate's memories of Burnside are often humorous and fondly recalled. The Long Way Home: The Story of a Homes Kid, most of all, drives home the profound importance of recognising every child's worth. The sequel to The Long Way Home begins with a young adult Kate, struggling to be accepted amongst her peers. The strength that got her through her childhood now seems elusive and her confidence falters as her attempts to ever become a member of a 'real family' continue to fail. Despite the darker subject matter, Kate's strength and refusal to submit to self-pity again shine through in this book. Young Kate must use her newfound strength and knowledge to choose the right path when the time comes. To find out more about the issues presented in Kate's publications, see below. Burnside: because children matter. (2011) Available from Burnside. Keen S. Burnside: 75 Years of Caring (1986) Available from Burnside. Hull and J.C. Ross. Chart and Compass: The Story of M.G. Ross. (1990) M.G. Ross was an accountant, and later, a superintendent of the homes for many years, having been a homes kid himself. This book includes comments about other children in the homes too. McIntyre R.G. The Story of Burnside (Angus and Robertson, 1947). Sometimes found in old books stores, libraries or church fetes. All text and images on this site © Kate Shayler. 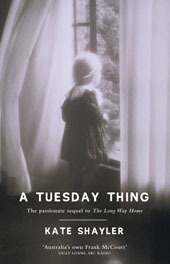 Text and covers for The Long Way Home and A Tuesday Thing © Random House Australia, 2011.